There’s a new super hero in town, and no, this one doesn’t come with underpants in the wrong place. This one comes with seven-and-a-half tentacles and an unusual supply of intelligence, enough to make Jyotin Goel write this almost-octopus’s adventures in ‘Sept-Opus’. He’s called Rot8 too; you know. Rotate – Rot8, because thanks to his missing limb he tends to spin and boomerang back to where he’s running away from, including a killer whale’s killer jaws closing in on him and … but that’s the suspense you need to read for yourself. I’m only going to tell you a wee bit more! 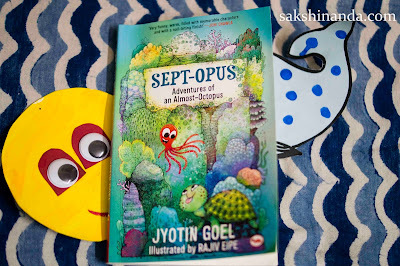 As much as the book made me feel 8-years-old again, I need to tell you in grown-up language why books like ‘Sept-Opus’ are great for young readers who are looking for novelty in their everyday reading. Jyotin Goel has created memorable and witty characters and set them in a suspenseful story in a very real monsoon-rich Goa. But what he has also achieved with this book is connecting with his young readers and involving them, almost reading their mind to take them along, and even asking them to guess what happens next with three bullet-ed options! Conversational but highly invented language, man meeting animal, the humour all over and interesting trivia to make parents happy are the USPs of this book. The novelty of the story is also in that it doesn’t lecture with a clear ‘thou shalt not’ moral at the end of it, but subtly eases kids into a revelation - the “power” of disability. There is no dearth of invention and imagination that has gone into this book. Have you ever met ‘eight-legged blobs of goo’ called Irrit8, Overw8 and even Po8, who writes verses? They speak ‘Octopi’, just like blowfish speak ‘Blowish’. For that matter, every single character in the book, human or animal, speaks differently from the other. In ‘Sept-Opus’, rather beautifully, all creatures are meeting in their truest best sans a shared language, or accent. It is where ideas of sibling love and loyalty, communal support and friendship, loneliness and heart-break, silly mistakes and forgiveness cut across the two defined Kingdoms as we know it, and bring Man and Animal on a common plank, whether above or below sea level. ‘Whale …tail…jail…fail…’ Po8 muttered, terrified. ‘W…what are you doing?’ Irrit8 whispered. Children love one, don’t they? And Rot8 is special, not just because of the “powers” he acquires in the lab or that he heroically ‘clamped to the whale’s fin’, but also because he is not usual. He has only 7 and a half limbs. And ‘Sept-Opus’ stands for the idea of how every lack comes with a special something in stead, and how disability thus becomes a specialty. Swimming to a conclusion then, ‘Sept-Opus’ is a children’s book that has it all. It will make them laugh, maybe go sniff-sniff in some scenes, keep them interested, entertain them with illustrations and plant a tiny moral seed in them too. It will be a treat to read aloud, thanks to how it has been written, and even more to be read aloud to. I would really love that! Anyone who reads this review will pick this book up...child or grown-up! I would highly recommend that they do, Sutapa. The book is for all. I love that you read me and leave behind your feedback. Another one with a difference; and you know this is a comment on both the book and on your review/ Loved reading this, and am sure the book is as loveable too. Wonderful to know of a fun and clever writer for little children. am moderating a panel on Children's Literature at KLF in Oct, so catching up on the latest happenings, new and good books, auhtors- so, that way too, happy to know of Jyotin and this book; it is so timely. The book is 'lovable', and all its characters too! In case I learn of more books in this genre, I will let you know. 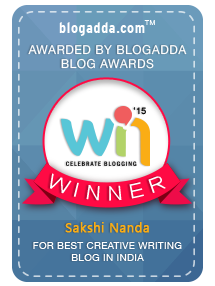 Sakshi, it is always a pleasure to read your articles and book reviews. The humor in your posts add to the depth of thoughts and emotions while taking the readers on a delightful roller coaster of wonderful words. How happy I am to see you here, and to read what you have to say. I am going to borrow that second line and add it to my CV. Big thank you, and also for sharing this piece further. It's satisfying to see so many writers for young readers who kneel down to their level to tell them stories they love. Only wish they had more visibility like their western counterparts. Through your review, love the book already! It must be tough to 'kneel down' (nicely put!) to young readers' level. I tried my hand at children's short stories for Katha when in college, and after a handful of stories I was sweating! What you say about visibility is very true. Also true for good adult fiction. It's a 'lovable' book, as Kiran puts it! The ability to read fluently is not a pre requisite for starting kindergarten. But many parents prefer to equip their children with reading skills before they go to kindergarten. Those parents think children who acquired reading ability before starting school will have a better schooling than other children who learn to read only after coming to school.